OK, let’s start with the new title at the top of of the site. You see, when I started the blog all those years ago it didn’t seem worth giving it a fancy title–after all, it was just me wittering away into the ether, like the survivor of a post-nuclear apocalypse with a ham radio set, broadcasting from the ruins of a collapsed civilisation in the hopes of finding other survivors, but with little hope of ever getting an answer. (And with a pesky mutant problem, too.) And then, as more and more of us gradually came together, if not enough to rebuild civilisation then certainly enough for a cricket team (the two are really synonymous, of course), I was more or less stuck with “Ganseys.com” by default. So why change it to “Gansey Nation”? Well, I like it because it describes what it feels like on this side of the keyboard, with so many people contributing and sharing their own projects—with the blog not just set to broadcast, but also to receive—that it genuinely feels to Margaret and me like a supportive interactive community. And with so many readers now we are, well, if not a nation (though we could kit out our navy in pretty snazzy jumpers if we were), certainly more than a cricket team. Here, as promised, is the pattern chart for the body of the current gansey. It’s based on Hebridean patterns from Michael Green’s and Rae Compton’s books. Now, it seems to me that the body should be textured, with interesting patterns, but not so spectacular as to overshadow the yoke (which is going to be a different set of patterns and will, I hope, be appropriately spectacular). So I have divided the body into seven panels on each side, front and back; and each panel is 25 stitches wide. The panels are divided by little 2-stitch cables, each flanked on either side with 2 purl stitches, cabling every sixth row. I’ve never done a cable narrower than 6 stitches before, and I really like the effect—they remind me of those thin stone columns in medieval Gothic cathedrals, arching up to heaven, and it makes me feel like I’m knitting a miniature cathedral in wool. The panels alternate a zigzag with moss-stitch diamonds. The diamonds will probably in turn alternate closed and open diamond patterns as they ascend the body, separated by two rows of purl stitches, while the zigzag will wend its serpentine way alongside. (This way, if the wearer ever gets bored on long car journeys, she can amuse herself by playing snakes and ladders on the pattern.) 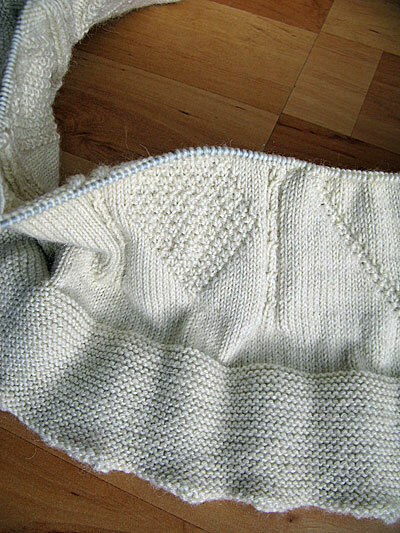 Like other Hebridean ganseys, the body patterns will extend as far as the armpits/gussets, when there will be a central panel, probably of a trellis, topped by the yoke. I’m still a little bemused by the garter stitch welt, which doesn’t behave itself nearly as well as the standard ribbing, but jumps up inappropriately like an over-excited puppy expecting a treat (“Down, Rascal!”). 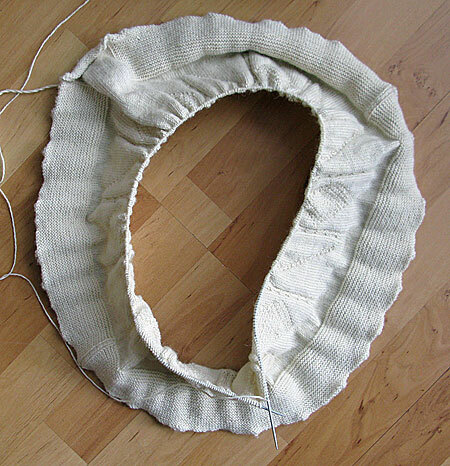 And there are times when it balloons out like a skirt, and it feels like I’m knitting a scale replica of a hovercraft. Still, no doubt it will all sort itself out once it’s been housetrained. 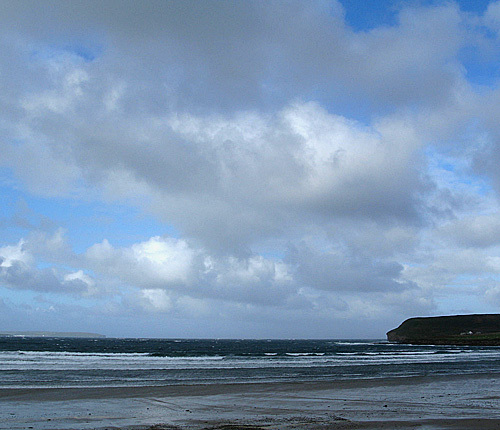 It’s been a wild week here in Caithness, gale force winds and driving rain (though today is gorgeous—blue skies, warm and no wind at all). We went for a scenic drive on Saturday to Dunnet beach, took a short cut and got lost (no road signs; where do they think this is, America?). The beach was deserted, wave after wave pounding the shore, spray whipped away by the wind. We went up to the viewing platform, but after ricocheting around like balls in a pinball machine for a minute decided enough was enough and retreated back to the car and amused ourselves watching unwary seagulls shooting backwards across the sky like clay pigeons. A tax-free nation – I like it! I finished the sweater I was knitting for Jim and gave it to him when they visited in August. Aaugh! I did not get a picture of him in it. Next visit. Now teaching sock knitting, have most of the 6 participants around the heel and heading for the toe. Stay grounded up there! 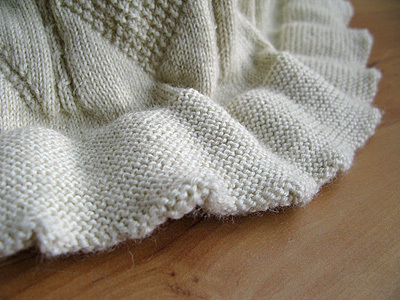 I believe that the flipping up is not the fault of the garter stitch but of the stockinette. I think someone I read tamed the connection by working tiny triangles at the top to taper into the stockinette. It’s a bit late now, but no doubt you will tame it in the blocking. I’m not worried about the flipping up. As you say, blocking will take care of it. And anyway, it’s traditional—I’ve seen pictures of the old guys with the welts turned up like a long cuff! We do so have road signs, at least at most intersections. Though you might have to wait for the leaves to fall off the trees to see some of them. Um, nevermind. Gansey Nation – I love it! As for my own knitting, I swear that it would have been quicker to knit my friend’s husband a Gansey from scratch – each time I repair one part, I take a look at another bit and think ‘Mmm? That looks as if it won’t last long’ and I end up re-knitting another bit. So what started with a request from him ‘Do you think you could repair the cuffs?’ has now run to not only re-knitting the cuffs (a lot fiddlier than I expected because it turned out that the sleeves had been knitted UP from the cuff and not DOWN from the shoulder) but also re-doing the shoulders, which of course meant that the neck had to be undone and then re-knitted but also on closer examination the garter stitch welts at the bottom had been very badly cobbled (by him not her!) around the edges to stop them fraying even further so they had to be cut away and all those stitches picked up so that the welts could be knitted down. I’m now thinking that a bit of swiss darning is called for on the elbows because otherwise they will go through in the relatively near future and make all the other repairs a bit pointless! Ah well! Hello Gordon, Gansey Nation- yes, very patriotic citizens, small but growing population. Next we’ll need an anthem and a flag and sheep. See what you can come up with. Nice wittering, btw. Gordon, the picture besides the ‘hovercraft’ paragraph is perfect. It really does look like one. Is this sweater going to have the garter welt at the waist or a bit lower around the hips? Sue G., LOL! You’re comment is so accurate. Thanks for the laugh. Sue, There are old pics of ganseys re-knit from the forearms down where the elbows and cuffs have frayed—sometimes in obviously different colours! How about leather elbow patches? Veronica, the gansey’s going to be quite long—some 29 inches—so the welt will definitely be “hip-hugging” once it’s finished. Plus the more observant will have noticed my sneaky mini-cables on the body to draw it in a bit. Hmmmm… a resounding “yes!” to “Gansey Nation”, where do I buy the baseball hat? If you go to YouTube and type in E8 Edwardian Farm and slide the timer tab to 44:03 I think the fellow’s wearring a gansey. Maybe someone could check it out and see if they see the pattern. I bet you know more than most, by the sound of it. No, don’t get me wrong, I’m a big fan of Alex, Ruth and Peter (I remember when he called himself “Fonz”!) and their programmes are a joy—no fake tension, no arguments, just three professionals who get on well making fascinating programmes. I had no idea until I watched Wartime Farm that 2,700 farmers had their farms taken off them in the war because they weren’t productive enough, or for growing the wrong things. Or that one farmer was shot dead resisting. Quite astonishing. I agree, I was quite shocked by that as well. Especially when the one man was saying that some of the demands were unreasonable such as requiring farming on boggy fields and other completely inappropriate terrain. Good example of how humans can corrupt even the best of intentions. The letter from the farmers doesn’t actually surprise me assuming it was sent at the beginning. From what you’ve written in the “Caithness at War” blog lots of people weren’t taking it seriously until the Germans were actually bombing nearby. And doesn’t that just sound like a stereotypical response from Highland farmers? Love it!